Katie is an absolute master at her craft. I went into my trial unsure of what I wanted to do with my hair. When I told Katie what I was thinking about, she gave me her honest opinion and showed me some examples. She then got to work and my hair came out better than I even imagined. On my wedding day, Katie arrived early and ready to get to work. She had a full day of doing 7 people's hair and she did a beautiful job. Everyone loved their hair and it stayed well all day even with some serious wind. Katie was a great person to have around on my wedding day. She was very calm and on schedule the whole day. I would highly recommend Katie! Beautiful hair, professional service, and wonderful person! I cannot rave enough about Katie Kelly: Hair + Make-up. From the first time I reached out to Katie she made me feel comfortable, relaxed, excited, and taken care of. Katie worked with me to identify my perfect bridal hair and then helped me readjust when my vision changed multiple times. She was easy to schedule trials with, responsive on email and text message, and helped assuage any anxiety I had leading up to the wedding. Katie's work speaks for itself, but she made everyone on the wedding day look amazing. From my long hair to my mother's short hair to my bridesmaids, she made each one of us look natural and beautiful. She listened to what everyone wanted and helped create a look for each person that made them feel beautiful. I would hire Katie again in a heartbeat and I strongly encourage everyone to do so! Katie Kelly is professional, personable and truly talented. I couldn’t recommend her more! Katie was absolutely amazing to work with! She understood exactly what I wanted for my wedding day and she turned my dream into reality. Not only did she welcome me into her home and made me feel comfortable for my first trial, she was available when I had second thoughts and needed another opinion for my look and then on the wedding day, she created the exact look I envisioned and that was truly me. She also did my mother-in-law and bridesmaids' hair and they all looked absolutely stunning. 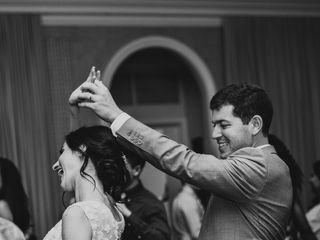 AND everyone’s hair lasted through hours and hours of dancing, which was crucial at my wedding! Katie is professional, personable and truly talented. I couldn’t recommend her more! Katie did hair for me and my bridesmaids for my wedding in the Catskills this past November. I knew the general style I wanted, but wasn’t sure I could pull it off. We did a trial a few weeks before the wedding and she immediately got the look I was going to when I described it... we tried two different versions of it (one up one down), and I ADORED both! I ultimately decided on wearing it low bun version because I was worried my hair wouldn’t hold curl if it was down, but even after letting it down halfway through my reception, the curls held perfectly! Katie was so sweet and showed up on time to my cabin in the woods that no one else could find on time. In my opinion her prices are lower than most for the quality of hairstyling she offers. Would recommend her to anyone looking for a boho style! Katie was so wonderful, I'm so glad we booked her for our Catskills wedding! When I first reached out, she was helpful with answering my (many) questions and pointing me to examples of her work. 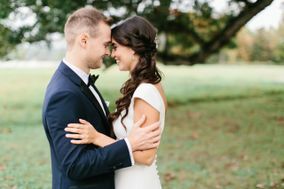 When my now wife and I went to her house for our wedding preview, she was super easy to chat with and listened attentively while we each explained what we were looking for. She worked well with each of our hair -- I have fine straight hair that can't hold a curl, but Katie got it to! And my wife has super thick curly hair that Katie was able to work with and tame into a beautiful elegant look. We talked through some tweaks once we were finished, and she had great suggestions how to improve the looks on our wedding day. Leading up to the big day, we ended up having more bridesmaids who wanted their hair done than we originally thought . Katie didn't break a sweat when it came down to discussing the schedule and timing though. She arrived and got down to business and we finished *ahead* of schedule. She was also such a delight to be around and her calm and friendly attitude definitely rubbed off on everyone around. We also had a bunch of different hair types and she did an amazing job on everyone. It was such a pleasure to work with her and I'm so glad we found her! Katie was a true professional and kept me at ease throughout the entire wedding planning process. She was accommodating with scheduling a trial and working with a busy schedule. Our wedding day was very muggy and my hair was perfect all night long. My bridesmaids had so much fun with Katie and her style is amazing. Don't keep searching for a hair stylist and book Katie! Katie was punctual and professional. She was very helpful in explaining how different styles would turn out. I went for a different updo from my trial, and I absolutely loved the final look (and received a ton of compliments)! I really enjoyed working with Katie and would highly recommend her! Katie was so great! Everyone was happy with how their hair looked, and styles lasted through the evening. She was able to easily imitate photos provided by bridesmaids, and offer suggestions/changes to styles if she thought something would work better. 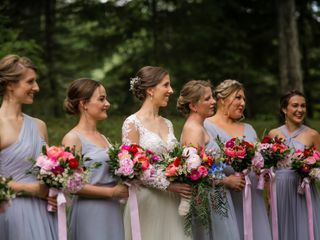 I wanted each bridesmaid to wear their hair however they wanted, which meant Katie was required to do many different styles and she nailed them all! I would definitely recommend her for wedding hair! Katie does a fantastic job! I was so excited to work with Katie after finding her on Instagram and meeting her for the bridal hair trial. 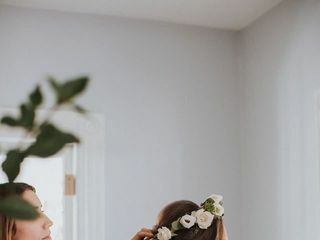 She's highly capable and very relaxing to be around - you can trust her to do a great job for the bride, the bridesmaids, the MOH, the MOB, and the flower girls! My hair lasted from 2pm-2am withstanding all the dancing, eating and hugging. Couldn't have been luckily to have found/worked with her! Katie Kelly was a dream to work with! Her professionalism, attention to detail, and calm demeanor put me right at ease on what had started as a hectic day. Her creativity and superb taste resulted in a romantic look beyond my highest expectations, and at a reasonable cost! My tough-to-please bridesmaids and mother were all thrilled with her work, particularly how perfectly she understood and executed their vision. We all looked fantastic and received numerous compliments over the course of the day. Highly recommend booking Katie ASAP for your special day! 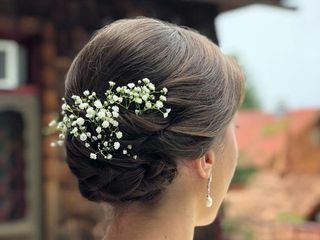 Hire Katie for your dream Wedding Hair! Katie was super responsive and communicative during the months leading up to the wedding. She asked a lot of questions and you could tell she really wanted to get a good understanding of me and my personality in order to make my wedding hair dreams come true! She was on time day of and worked quickly to get all the girls' hair done. I loved everything she helped the girls decide on, the styles really fit the girls' faces and personalities and everyone looked amazing! My hair was FABULOUS and held up till the very end of the night (despite humidity and sweating) and I got endless compliments on it. She did a phenomenal job, is super talented and I can't recommend her enough. Do yourself a favor and hire Katie for your wedding day! Thanks so much, Katie! 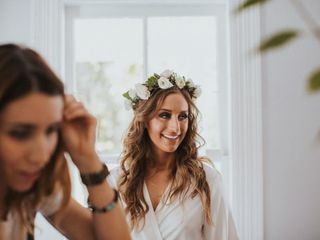 I worked with Katie through another company for hair on my wedding so I can’t speak to how she runs things but for our trial and wedding day she was amazing! On the day of the wedding it was raining all day and I was going back and forth with if I should keep to my original style of half up and half down that I did during the trial and loved so much. She was honest and took the time to look at the weather forecast and humidity to give me an honest opinion. Because of her I stuck with my plan and I’m so happy I did. We were a two bride wedding as well and there was a lot of hair to be done. Everyone looked so great. When we finished a little early she stayed until our original end time to make sure anyone who needed a touch up got one. I hadn’t planned any hair accessories either and didn’t really care but my now wife had extras and it was Katie’s idea to use them. She kindly ran to the other room to get them and added them to my hair. They really added a nice touch and I was glad she did that. I should also mention that all of our bridesmaids looked stunning! She is awesome at hair and I highly recommend her! Where do I even begin? I had my trial and fell absolutely in love with the most whimsical perfect ponytail that Katie whipped up after showing her about three different versions and asking for a hybrid. Fast forward to my dress fitting and at the last minute decided I NEEDED ALL MY HAIR UP! Katie knocked it out of the park (and I have A LOT of hair). She also masterfully crafted styles for my entire wedding party that complimented their personal style and their dresses (everyone was different). Everyone looked like a dream!! I am so grateful! Katie did the hair for my April 21st wedding and she was an absolute dream. She did updos for me and three bridesmaids and blow-outs for the mothers of the bride and groom. Katie did exactly what I envisioned with my hair and it lasted the whole evening (10+ hours) and still looked good even after I took the veil out. Even my notoriously fussy mother was happy with her hair and very impressed that the styling lasted all night. If you are thinking about booking Katie for your next event, I highly recommend her. From the trial through the wedding, she was great to work with! Katie was wonderful to work with! She was super communicative, receptive, and thorough, and brought her talent and professionalism through each step of the process from beginning to end. She made me and my girls look amazing. Each of us had a style that was very individual, from boho to glam, and each style was done with a creative eye and attention to detail. 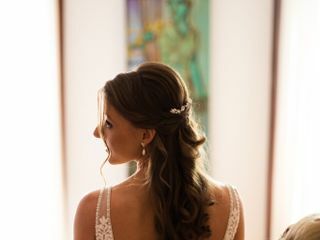 I loved my low updo with fishtail braids! I would book Katie again in a heartbeat, and recommend her wholeheartedly to any bride in the NYC area. Thank you Kelly, for your amazing work and making me and my bridal party feel so beautiful on my wedding day! Katie Kelly did my hair for my wedding in October and I couldn't have been happier! I made a few small tweaks as to how I wanted it from my trial and she executed perfectly. My hair perfectly matched the rustic chic vibe I was going for and I had compliments all night. Katie also managed to do all 14 bridesmaids/mothers/stepsisters/inlaws done perfectly that morning. I cannot thank her enough!!! 5 stars! the case. She was able to style each hairstyle exactly based on the Pinterest pictures they provided. For the entire wedding planning process, I had such a difficult time selecting a hairstyle for myself. I went through multiple trials with multiple artists. I even changed my wedding day style from my trial with katie. On the day of, Katie was able to create a style that was what I always envisioned. I am so happy with the way I looked. She was also able to keep things moving that day, and was so accommodating and professional. It was truly a pleasure to work with her and I am so thankful I found her!! Katie was an absolute pleasure to work with! I found her on social media and was so excited to have a trial with her. Not only was she so down to earth and friendly to work with, but she brought my vision to life. I felt confident going into the wedding that I was in such good hands having Katie as my hair stylist. My hair came out gorgeous, so did my bridesmaids, MOB and MOG. Everyone looked absolutely stunning and we couldn't have done it without Katie! She was so thorough with everyone, yet still finished with plenty of time to spare! It was truly a relaxing day, we never felt rushed or stressed. I cannot thank her enough for her time management skills, creativity and talent! Katie was amazing to work with from start to finish. She nailed the look I was going for in the trial and recreated (and even made it more beautiful) for the wedding day. She is incredibly responsive, goes with the flow, and was able to get through my fairly large bridal party with time to spare. I could not have been happier to use her and would love an excuse to work with her again. Katie did hair for my bridesmaids, my mom, and myself and we all could not have been happier with the GORGEOUS work she did. I felt glamorous but natural and everyone kept saying that they felt like princesses! Beyond her incredible work, Katie was friendly and warm and chatted along with my friends and I as we got ready. She was also wonderful at my trial and kept me updated as we approached the wedding date with helpful info. I wish I could have Katie do my hair every day, and would recommend her a million times over for your bridal hair! Katie was wonderful to work with! She accommodated my large bridal party, all with different types of hair, and everyone looked beautiful! We were ready ahead of schedule even with adding a few extra people to list. I would definitely recommend her, she's sweet, calm and very talented. Katie was amazing. Not only is she talented, she is very helpful with helping people figure out what works for them. I am personally bad at making decisions, and was struggling with what to do with my hair for my wedding and was anxious about making that decision. She gave me an honest opinion about what would work for me and I could not have been happier. She knew how to give me a style that worked for me physically and my personality. The day of the wedding, she got everyone done with time to spare, and everyone looked beautiful! She has such a wide range of ability for styles and can do anything you ask! Katie was also just very sweet and great to work with. These ladies were fantastic to work with. Even when I wasn't sure what I wanted, they brainstormed with me and made sure I was 100% happy with my hair and makeup before the end of my trial. Absolutely loved them, and I had never felt so beautiful in my life. Katie is so receptive to opinions and really took the time to make sure I was 100% happy every time she did my hair. When Katie did my engagement photo shoot hair, it was 95 degrees outside and humid and the style lasted perfectly through the entire outdoor shoot (and even when I changed and went out afterwards!) 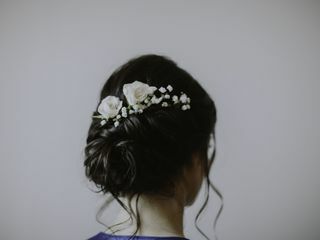 For both my bridal portraits and my day-of wedding hair, she ensured the concerns I have with my hair type were handled and that I felt confident and beautiful!